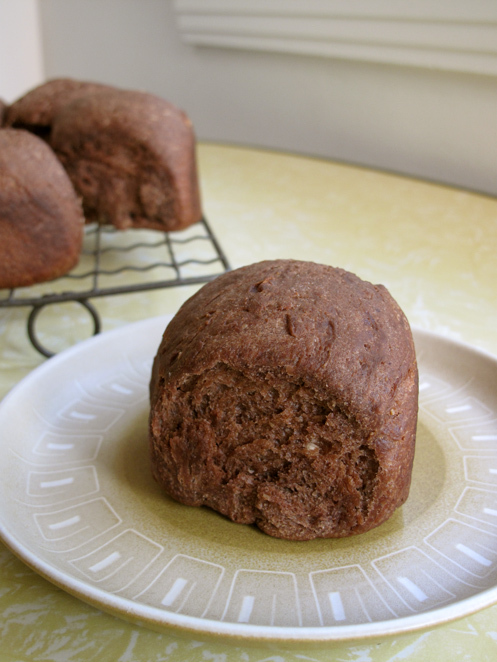 This entry was posted in Baking Bread and tagged biga, bread, chocolate peanut butter bread, dough rolled in cocoa, food, homemade, recipes, sourdough by cityhippyfarmgirl. Bookmark the permalink. You could throw some bacon (and possibly a chicken)on it and call it Elvis bread. It looks delicious!!! Elvis bread, now there’s a thought…. I do have the lovely book. A friend gave it to me just a few weeks ago, (actually same friend who challenged me with the bread.) 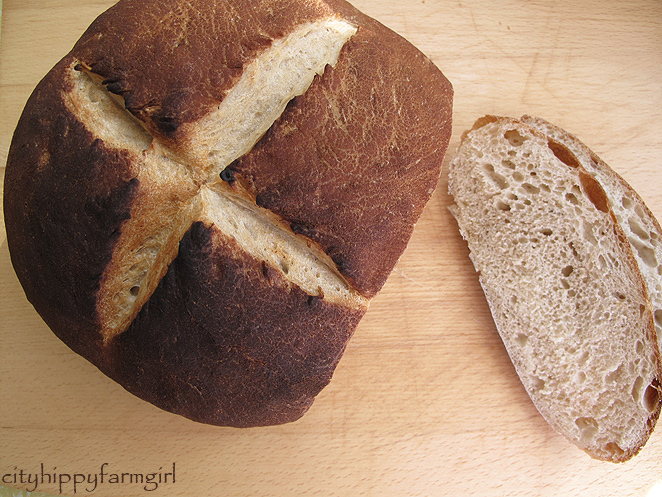 I had a look at the walnut bread and like the idea of layering the flavours. Tah-dah! It looks great. I’m sorry the recipe has been difficult, but it sounds like you’ve found a great alternative. His recipe does look good. I’d love to quiz him on the peanut butter. My first two incarnations of the bread used crunchy peanut butter and the chunks of peanut I thought, tasted slightly rancid or stale when incorporated into the bread. Even though before cooking it’s fine. I used smooth peanut butter the last time though which did work a bit better. gawd! two months of wheat now and that just looks and sounds bery . very wonderful. Best to your wee one- little mite is a doing it tough, you too. Thanks for the kind words Kel. Oooh, exciting… I like the look of the second one! See it looks ok, but the taste is too dense and dry. Sometimes you need to endure a few hiccups along the way, till you finally get to the desired result. Sounds like it was worth it in the end! Great shot that last pic. Experimentation is so much fun- when you have the time and flour to spare. I’m so glad you thought to take us along on your journey- and happy to see the final product! I’d almost rather slaver my own peanut butter on top of each slice. 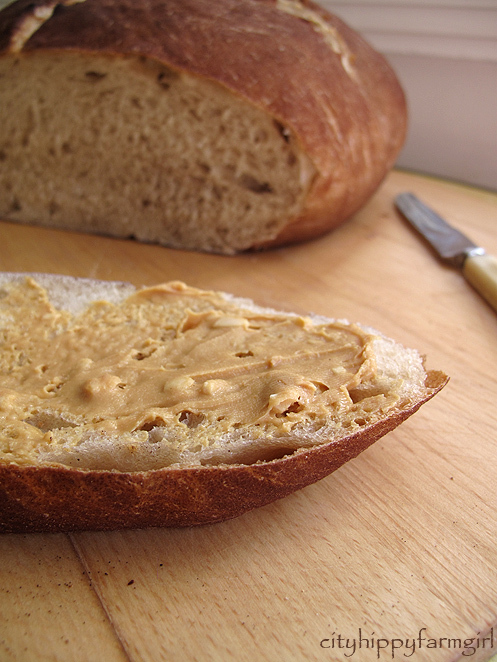 You get more and can choose how much pb your palate can take! That’s the thing with my experimenting, regardless of what it tastes like, I have to be prepared to eat it and not waste ingredients. Calculated risks! Holy Hubcaps, this looks amazing. And what a delightful cheffy you are, all that experimenting, Im impressed lovely. 🙂 Brilliant photos too. Glad to see you haven’ lost your cooking mojo with all the recent drama’s. This looks great. Luckily had a few in the draft box Amanda. Cooking mojo is zip at the moment. Oh wow, now you have me so curious, this looks AND sounds amazing! Oh wowee – looks amazing. And just what I need right now!